Great photo. I love the way Juncos look the way I draw small birds. Great image, Mike. I like the hint of sky. on January 17, 2019 at 1:01 pm | Reply Molly D.
Love this one! 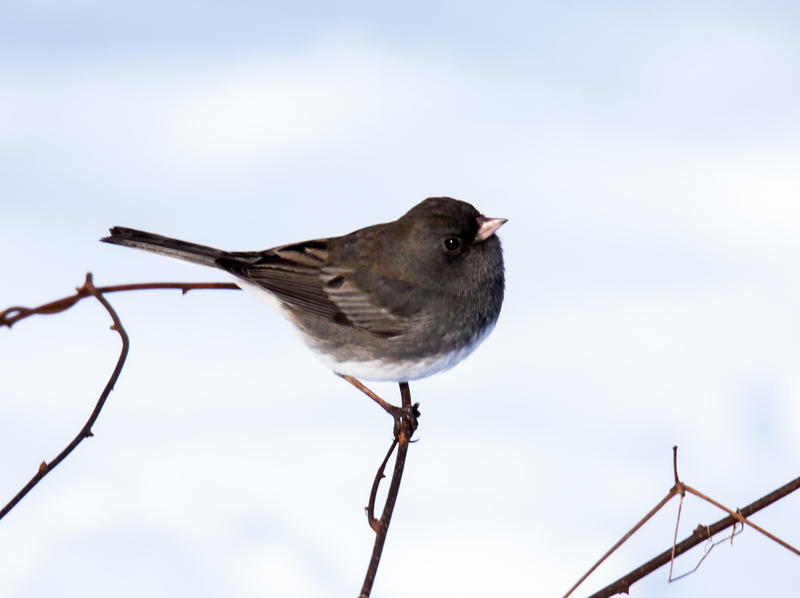 I always think the Junco looks like someone held it by its feet and dipped it in an ink well! This Dark-eyed Junco looks very much like a bird my Gram used to call a Snowbird. They were almost always seen scavenging beneath the feeders, more often than in them. He is posing nicely for his portrait. Thank-you, Mr. Mike!! Thanks for the info, Ellen. This bird, if fact, was scavenging a bit later right underneath a bird feeder in the neighborhood. I don’t think that I ever saw it fly up to use the feeder as some other birds did. Nice phot Mike! Thanks for sharing!